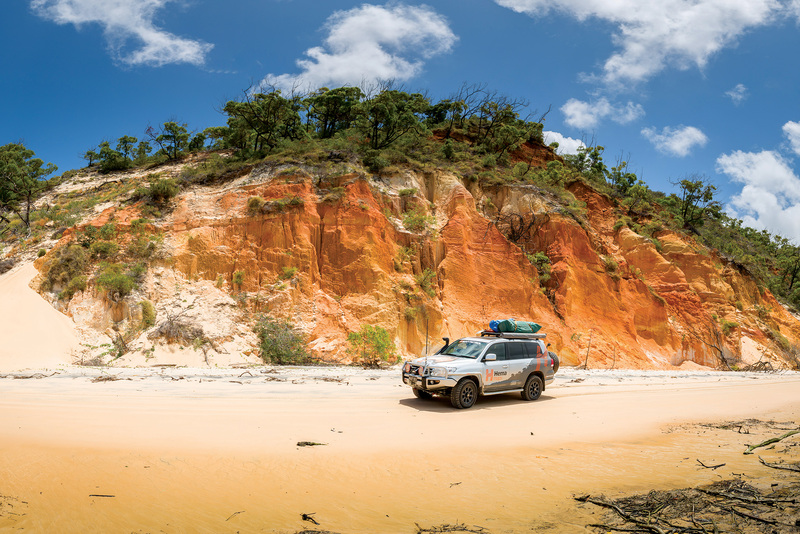 Cape York Peninsula, the region featuring Australia’s northernmost point, magnetises camper trailer enthusiasts from around the country. Tales of adventure and of overcoming challenge have rendered the Tip a figurative peak within our minds. Its appeal follows a logical progression. We start out with easier to access destinations close to home, then gain confidence and wish to challenge ourselves and our gear. While we’re at it we take a fancy to seeing what Australia has to offer at its unhinged, uninhibited best. Everywhere we travel we hear whispers of Cape York and we realise, this is the place for us. And off we go. It’s a challenging landscape. It takes a lot of time, even when taking the most direct and inland route. Add to this that people are itching to reach the Tip; they’re Bamaga-bound with an enthusiasm bordering on hysteria. The end result is that people miss out on the many beautiful, exciting detours that can be worked into trips to the Cape. The beaten path, AKA the Old Telegraph Track, gets even easier to follow as it gains prominence – although perhaps ‘easy’ is the wrong word, when you consider obstacles like Gunshot Creek – so in this article Camper explores some of the lesser known spots worth your time and effort, whether you are revisiting or towing to the Tip for the first time. Cooktown offers an option for an early detour, allowing you to set a nice relaxed pace for your grand romp. How you get there is up to you. If you are coming from Cairns, the options are inland via Mulligan Highway or along the coast via the CREB track or Bloomfield Track. The inland route will be easier going, although the Bloomfield is a plausible route with a camper when in good conditions – and the rainforest, waterfalls and difficulty make it more exciting than the tarmac. 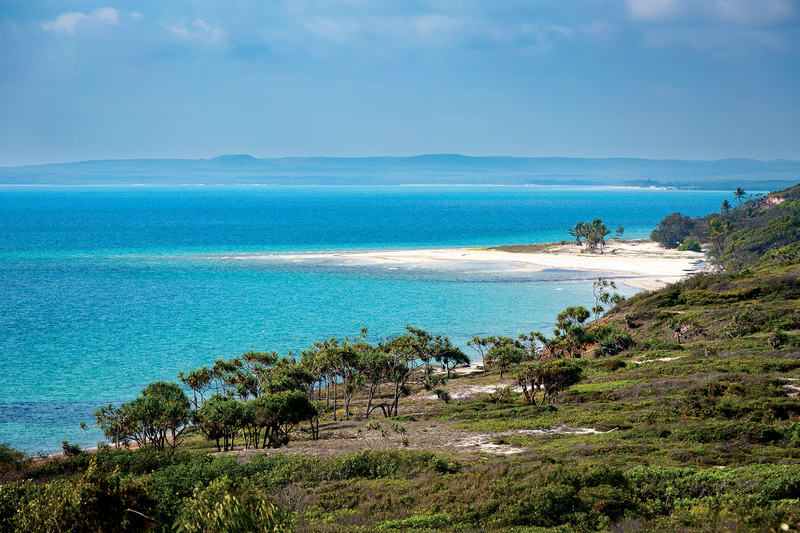 It will also take you through Cedar Bay National Park, where a hippie commune was infamously destroyed by 1970s Queensland Premier Bjelke-Petersen. Not so groovy. 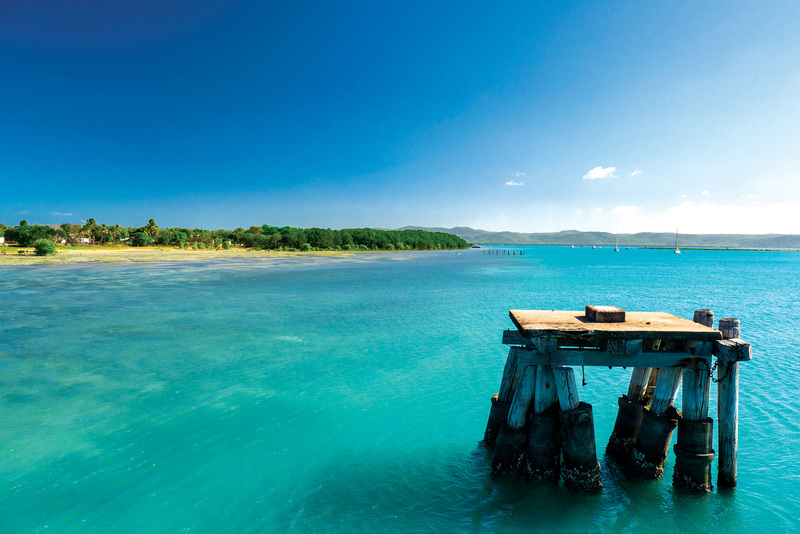 Once you reach Cooktown, there is plenty to check out, whatever your beat is. 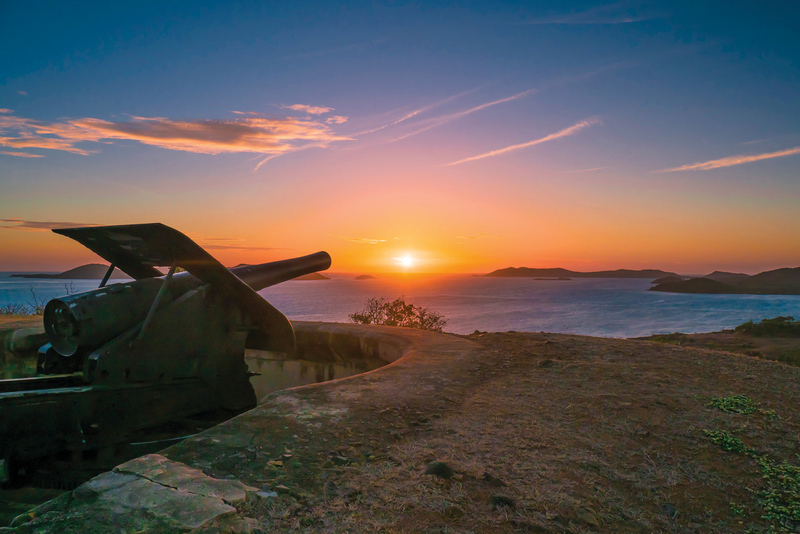 A good option to cover all bases is the Scenic Rim Walking Trail, which weaves around the area, connecting historical banks and hospitals, Cherry Tree Bay and the James Cook Museum – which exhibits both equipment from Cook’s Endeavour and an indigenous perspective on his arrival. 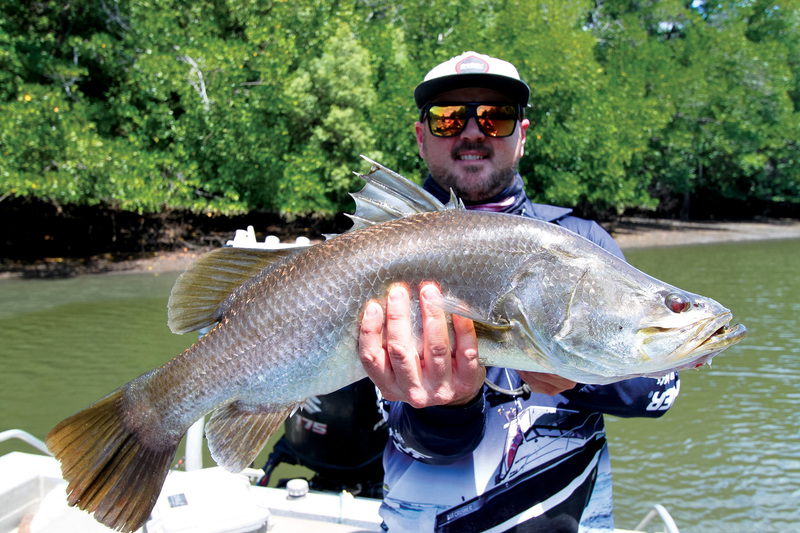 Alternatively head to the town wharf and wet a line for barramundi or Spanish mackerel. The town is dominated by Grassy Hill, standing 162 metres above sea level. The view from the top is stunning. You can trace the snaking estuaries, as they weave towards the jagged horizon; marvel at the boats, small from afar, within the deeper channels separated by sandbars; and witness the shadows of the clouds darken the greenery as they float over the plain. To gain a view from even higher you can hike an arduous six kilometres up to Mount Cook. Just north of Cooktown is land managed by indigenous Australians, requiring permission to access. Here, you can find Elim Beach with its famous coloured sands and campsites. Further on is Cape Flattery, with its curious silica sand mine, gathering up to two million tonnes a year for the glass, foundry and chemical industries. 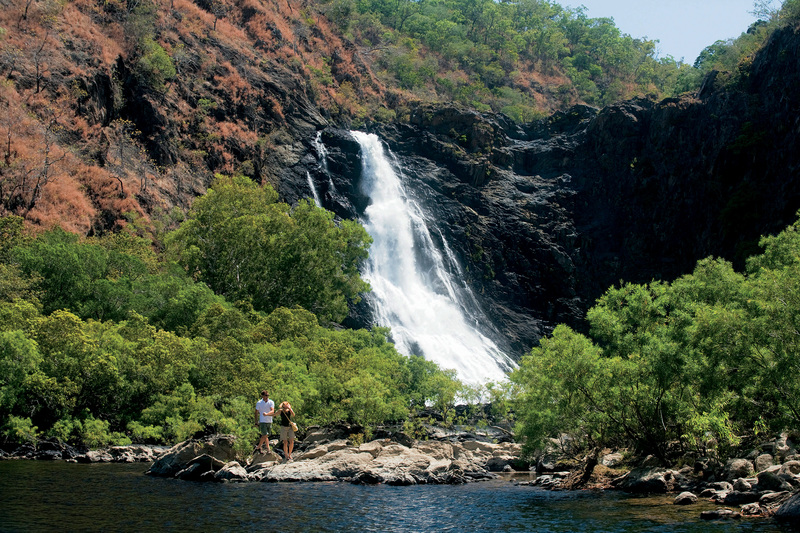 There are two ways to Cape Melville itself, and they’re not cakewalks. The easiest way is from the west; commencing from Kalpowar Crossing, it takes approximately five hours. The alternative route is up from the south via Starcke National Park and it will have you travelling at an average speed of less than 20 kilometres. You can forget about both routes in the wet season. It might be best to leave the camper behind, particularly for the route from the south. Only take this on if you’re super serious; drive with low range gearing and then only if you have high ground clearance, traction aids, recovery gear and a serious offroad camper. And beware that if you come from the south you’ll be missing Laura, with its Split Rock and famous homestead, from your itinerary. Once you begin to approach the area, the difficulty of access will no doubt feed into your appreciation of the stellar landscapes. 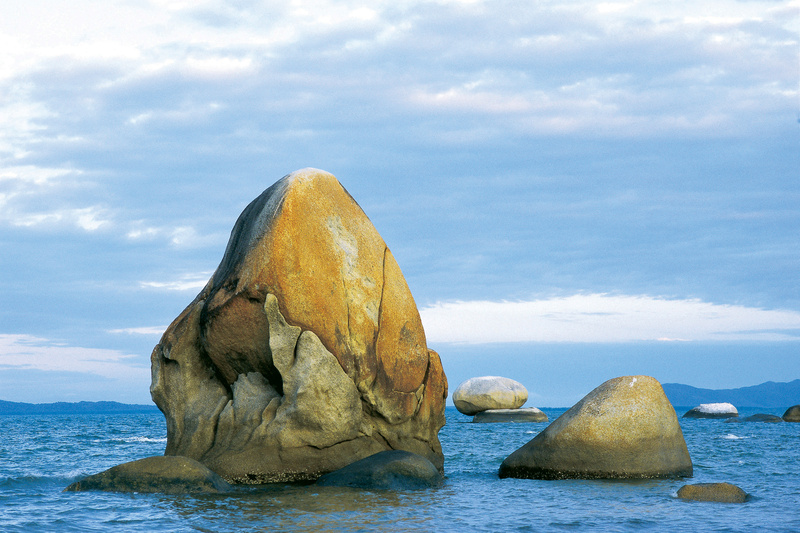 You’ll pass by the Melville Range: piles of smooth granite boulders, maxing at a height of 418 metres – a weird natural phenomenon suggesting the presence of some sort of gigantic dump truck. The ranges reach right to the shore, adding white sand and increasingly dense flora into the equation. Look out for the memorial stone commemorating the 300 lives lost at the hands of Cyclone Mahina in 1899. Nearby, check out the turquoise paradise of Bathurst Head. Look north towards Flinders Island and its neighbours, or head to the other side and gaze over Princess Charlotte Bay, which receives three rivers and is fringed by mangroves. Keep your eyes open for unique native wildlife, including two endemic breeds of frog. Enjoy the bush camping provided both at Bathurst Head and along the road into it, just make sure you purchase an e-permit first. Branching off from the Peninsula Development Road north-east along Portland Road or off from Telegraph Road east along Frenchman’s Track, you will arrive at Kutini-Payamu (Iron Range) National Park. When choosing your road, research conditions. One main reason for the detour is Chili Beach: a flat strip of sand, varying in size depending on the tide, curving away into the distance, with leaning coconut palms tossing in the wind on one side, and lapping waves on the other. The beach is perfect for a lengthy stroll, and from the northern end you can see Restoration Island – the legendary site where, following a mutiny in Tahiti, Captain William Bligh and his crew drifted ashore and replenished their strength with local oysters; and also the living place of millionaire-turned-castaway, David Glasheen. There’s a chance you’ll see an array of local wildlife too, from the friendly palm cockatoo to the slightly more intimidating cassowary. Heading out with a spotlight at night opens up the nocturnal cast of animals ranging from green pythons, spotted cuscus, bandicoots and Papuan frogmouths. Camping around here is easy with the help of four designated areas: three in the rainforest beside Portland Road (called Rainforest, Gordon Creek and Cooks Hut) as well as one at Chili Beach itself. Just don’t pull up under a coconut palm! That’s only the start of what there is to discover. On your way in, you’ll pass by Mount Tozer, where it’s a 100 metre stroll to a vantage point 500 metres above sea level. Portland Roads, a tiny community that still manages to have a cafe, tells a rich historical story of gold, war and industry. 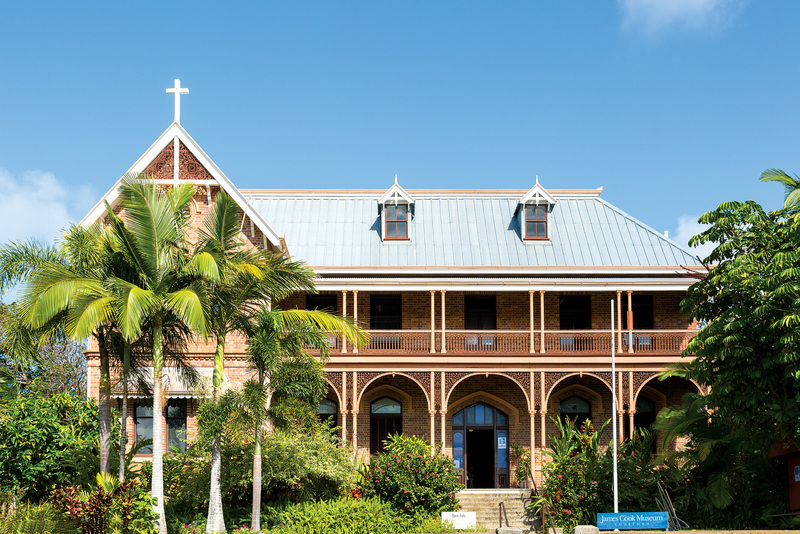 Lockhart River, the site of a former indigenous mission, adds even more colour to the Cape with its art centre and art culture. The Gulf of Carpentaria side of the peninsula also deserves some credit, particularly Weipa, a mining town that has proven to be something of a gem in itself. 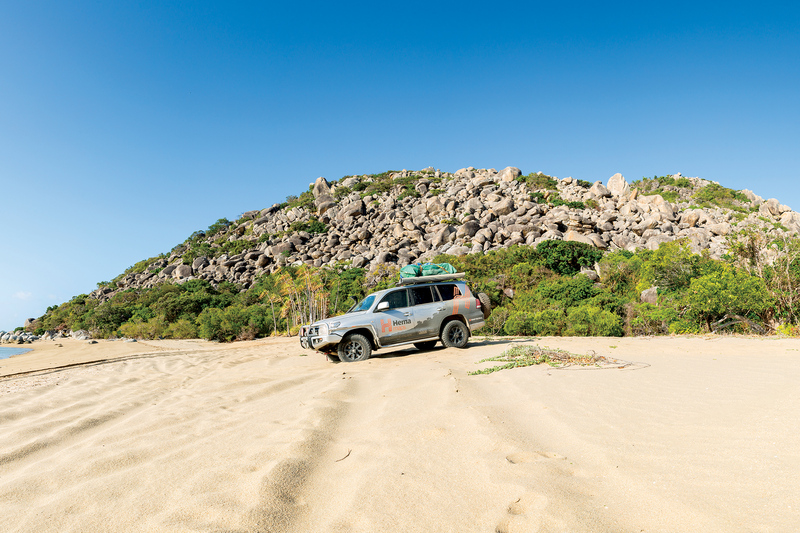 You’ll be able to stock up on resources – a rare opportunity on the Cape – with one of the region’s cheapest supermarkets, a 4WD and camping store, and a fishing shop. If you haven’t been fishing already, now might be a time to pick up a rod; the lack of commercial netting throughout the estuary systems has allowed local species to thrive and grow to prize-worthy size. Evans Landing wharf is a good starting point, allowing you to have a crack at queenfish, trevally and jewfish – and if you’re struggling to tie a basic paternoster, there are plenty of charters in the area. Even if you don’t catch, you’ll still be able to enjoy the sun setting over the Gulf, dyeing the sky orange and silhouetting the trees. Weipa provides plenty of further opportunities to expose yourself to the idiosyncrasies of this secluded part of the country, all while operating out the comfort and convenience of your camper. A mine tour will take you to Rocky Point and showcase the mining process from loading the ore into huge trucks to conveying it to the wharf; an inland track will give you flashbacks to the war, with its WW2 B-17E Flying Fortress crash site; and the banks of the rivers, such as Embley and Pine, will awe you with their huge mounds of shells, which are disputably cultural or natural in origin. If you’re suffering from a case of itinerary overload, don’t worry, this list is over. But that isn’t to say this list is exhaustive. The Cape is something like the magic pudding that keeps on replenishing itself. There is no way that we can ever finish it. There are people who have been twenty, thirty, forty times. There are always new places to visit, and even when returning to places you find them different or discover new things about them. As tourism in the area increases, more and more places may become accessible. Yet half of the appeal lies in the ruggedness and challenge of the Cape, meaning there really is no better time to visit than now!